Working in conjunction with a builder and an interior designer, Cabinets by Dario brought to life an impressive kitchen and bathroom that sets a new standard in design. 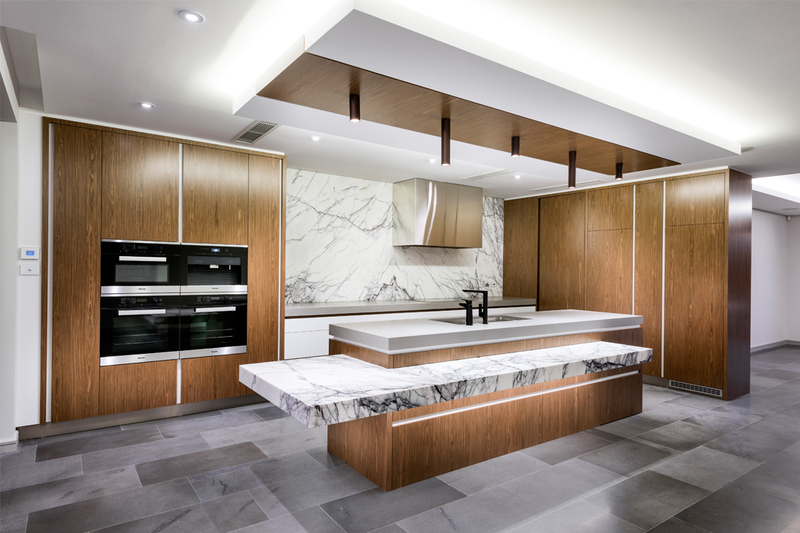 The kitchen brings together the warmth of walnut veneer with that sleek and contemporary look of white lacquer. Both elements grace handle-less drawer and cupboard profiles with recessed finger-pulls that make the beauty of the materials reign supreme, while also permitting easy use. Completely integrated appliances let the kitchen look like somewhat of a statement in itself, rather than the highly functional utility area that it is. 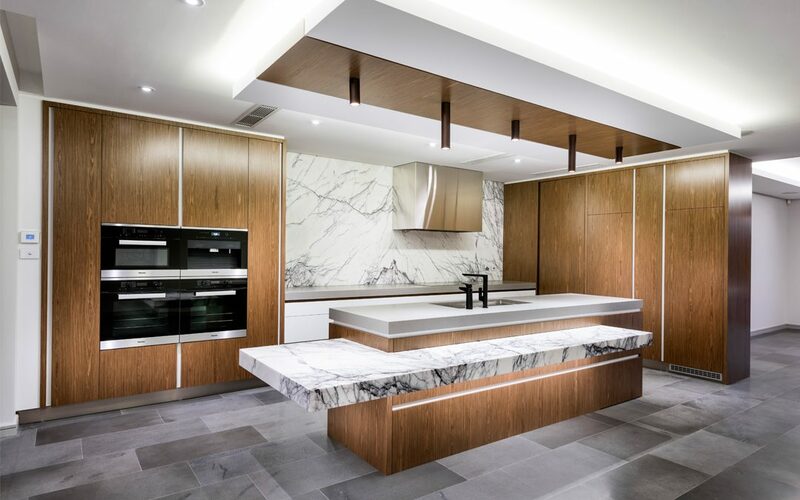 However, perhaps the most striking elements of the kitchen are the veneer bulkhead with integrated lighting and the cantilevered marble breakfast bar. The bulkhead ties in with the material palette of the cabinets, and completes the kitchen design scheme in spectacular fashion. Pale grey stone benchtops set off the beautifully grained marble that stretches from benchtop to ceiling, and wraps the island bench in the form of a breakfast bar. 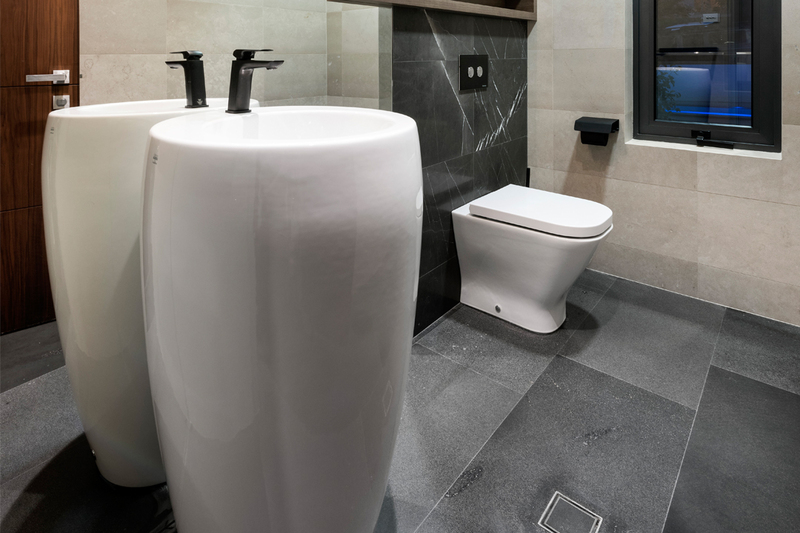 Completing the contemporary look are matte-black taps and a stainless steel flush-mounted sink. 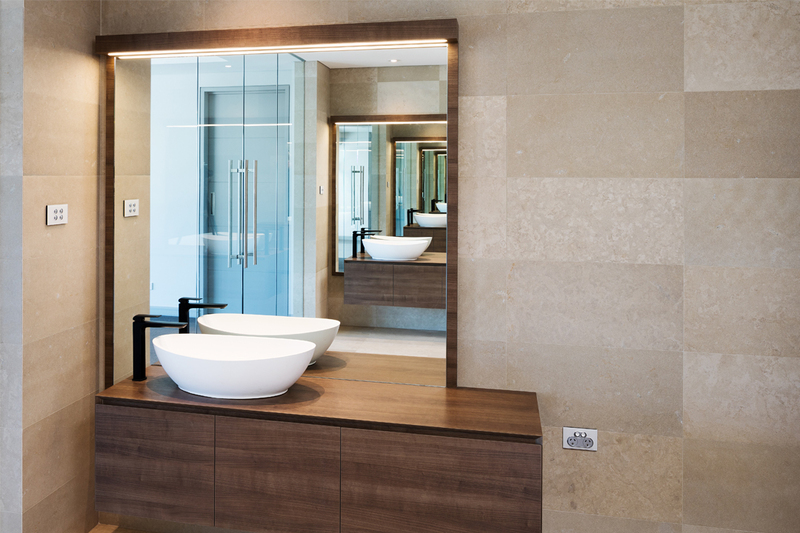 Each of the home’s bathrooms displays a unique design aesthetic, but all exude the unmistakable Cabinets by Dario style. Carrying through the walnut, white and matte-black palette from the kitchen, the family bathroom sets itself apart with the use of sand-coloured, large-format tiles. Another bathroom is graced with a statement freestanding sink, which is again complemented with a matte-black tap. Consistency is created with timber that is used for three recessed shelves, which act as a wall feature as well, and transverse the connection between the black marble tiles and the floor-to-ceiling mirror on the walls. The project is a stunning example of the capacity of Cabinets by Dario to create a selection of spaces that each possess their own style but are woven with a common thread. Cabinets by Dario prides itself on attention to detail and delivering a result that is beyond what its clients could imagine.